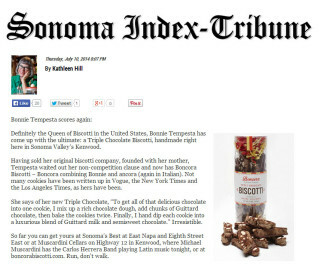 Triple Chocolate Review in Sonoma Index-Tribune: Bonnie Tempesta Scores Again! Definitely the Queen of Biscotti in the United States, Bonnie Tempesta has come up with the ultimate: a Triple Chocolate Biscotti, handmade right here in Sonoma Valley’s Kenwood. Having sold her original biscotti company, founded with her mother, Tempesta waited out her non-competition clause and now has Boncora Biscotti – Boncora combining Bonnie and ancora (again in Italian). Not many cookies have been written up in Vogue, the New York Times and the Los Angeles Times, as hers have been. She says of her new Triple Chocolate, “To get all of that delicious chocolate into one cookie, I mix up a rich chocolate dough, add chunks of Guittard chocolate, then bake the cookies twice. Finally, I hand dip each cookie into a luxurious blend of Guittard milk and semisweet chocolate.” Irresistible. So far you can get yours at Sonoma’s Best at East Napa and Eighth Street East or at Muscardini Cellars on Highway 12 in Kenwood, where Michael Muscardini has the Carlos Herrera Band playing Latin music tonight, or at boncorabiscotti.com. Run, don’t walk.